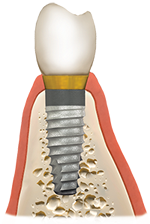 Dental Implants are now a method of choice in many cases to replace a lost tooth or teeth. A full assessment is essential to decide if dental implants are the right solution for you. This can be ascertained at your initial consultation. There are very few medical reasons why a person is not a suitable candidate for an implant. A patient with Type II Diabetes which is controlled can have an implant. A smoker can have an implant but the risk of failure is higher and healing generally takes longer. Obviously, it is better for many reasons that patients do not smoke. A full medical history is the first part of the evaluation process. There are other options besides implants such as a partial denture, a fixed bridge, or even possibly orthodontics to fill that space in your mouth. It is not wise to place implants in a young person who is still growing. Surprisingly older people were the first people to embrace implants as a replacement to dentures that they had been wearing for many many years. The next thing we do is evaluate the site for the implant and assess if there is enough room and height for an implant supported crown and then if there is enough bone to place the implant into without getting too close to any important structures that will cause complications. If there is not enough bone, there are procedures available to augment the bone which will add another step in the process. 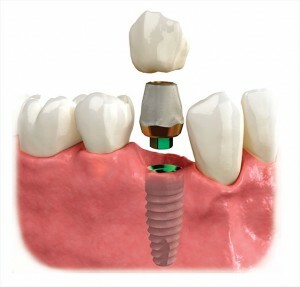 The cost of a single implant is between $5000 and $6000, and will generally take from 3 to 6 months from start to finish. There are some systems where the finished restoration is placed at the same time as the fixture, and some techniques were a full arch is placed on four fixtures. The biology of implant dentistry is well understood now and it takes time for the fixture to integrate. The saying you can’t hurry nature is very true with implants. It is my personal opinion that the highest chance of success is when the fixture has been left to integrate properly. There are ways to provide an aesthetic temporary solution while the fixture integrates with the bone. Shortly after the first consultation appointment, we take impressions for study models. We will give you a referral for a 3-D x-ray scan, (I-cat scan) of the area of interest. This involves much less radiation than a full medical CT scan. We will then sit down and discuss with you how we will achieve the result you want. I will go through all of your options and discuss the pros and cons of each one and answer all your questions. Read our post on the ‘The stages involved in getting a dental implant’ for further information. Once we have answered all your questions and you have given us your informed consent for your preferred option, an appointment is made for the fixture placement. This is done using a full operating theatre protocol to eliminate the possibility of cross-contamination and infection. I also operate using an operating microscope, which means I place the fixture doing keyhole surgery. The keyhole approach is more conservative, more comfortable for the patient in terms of minimal to no post-operative pain and avoids the need for flap surgery and sutures. My patients find it surprisingly comfortable with very little or no post-operative pain. We will give you thorough post-operative instructions, and we are here if you have any problems. Generally three months later we assess the implant to see how well it has integrated and work will then begin to make the final restoration. Enquiries from patients wanting an implant/s are best made with a preliminary consultation appointment. Telephone enquiries beyond the most general information are inadequate, as each person as an individual, their individual requirements are unique, and can only be accurately assessed and discussed in a face-to-face appointment. In the second half of 2009 I undertook training to place implant fixtures. At that time I had been doing the restorative part of dental implants for a number of years. After doing many weekend courses to surgically place implants, I felt they lacked structure and depth and did not feel confident to start placing the fixture in my patients with so little training. I looked around for a more formal substantial training course that offered what I needed. The Australian Society of implant dentistry (ASID) offered a three-tiered course which appeared logical and structured, giving me the depth of knowledge I was looking for. Level one of the course consisted of a good introduction and background on implants. Level II was a more intensive course of anatomy, physiology, biochemistry and the basic science behind successful modern implant dentistry. At the end of level II there was an examination which some of my fellow course participants failed. Those of us that passed level II went on to level III which involved intensive instruction on assessing patients for implant placement and the information needed to actually place the fixtures. After all the theory there was a practical session where we were able to use eight different systems to place fixtures in artificial bone. Then came the final exam. Shortly after passing the exam, I placed my first three fixtures in patients. This marked the start of my involvement in the surgical side of implant dentistry. Since that time I have continued to place dental implants and attended many more courses. I am still a member of the ASID and my knowledge, experience and confidence continue to grow. There are in excess of 30 different implant systems manufactured in different parts of the world by different companies. There have always been about six systems that had the lion’s share of the market. Each system is unique in its size, shape, configuration, composition and with its own set of instruments and tools specifically for that system. Today there are now copycat systems of the most popular ones. The techniques for each system is subtly different, and one system will not interchange with another. During my training, I had the opportunity to evaluate eight of the more popular systems, and very soon went on to use Biohorizons fixtures exclusively. The reason behind this is that Biohorizons fixtures are a very good quality implant system with solid scientific background. They are not widely known in Australia, but are an American based company with a large market share in many countries. Late in 2013 the American-based company Henry Schein, which has a large presence here, (the largest dental and medical supply company in the world) bought 60% of the Biohorizons company. Clearly they see Biohorizons as a market leader in the world of implants. The copyright for the above article is owned by Dr.R.D Skinner – Dentist Melbourne.